Alo Konsen, of Brain Shavings, brought attention to a survey that charts where a person is positioned along the political spectrum. 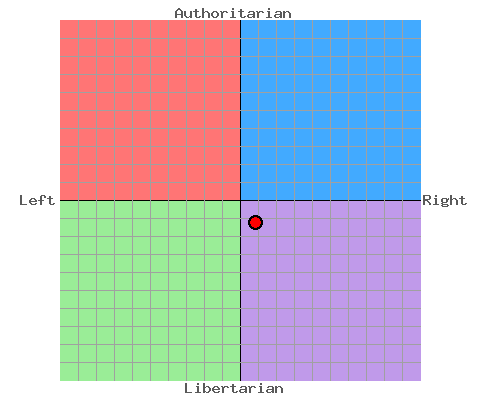 You can find and take the survey yourselves here, at The Political Compass. Alo Konsen sent an email to members of the State of Ohio Blogger Alliance (a blogroll of which is found in my left-hand sidebar) inviting the members to take the survey themselves and share the results. I took the survey, and my chart appears below. This result was surprising to me, since I thought I’d be plotted much farther to the right along the x-axis. But then, if that were the case, I suppose I wouldn’t be called a RINO, would I? But, such being the case, I suppose my intro in my right-hand sidebar is quite apt (thus, so is this entry from Pho’s Akron Pages from about the time my blog was launched). However, let me just say that I will NOT be following in the footsteps of Arlen Specter, and I have NO plans to switch parties.